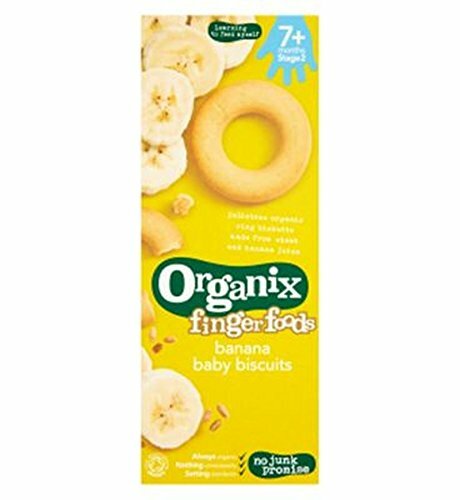 Organix Banana Ring Biscuit 54g Your baby is constantly learning and exploring the world around them and food can play a part in that too. That's why we've created a range of Finger Foods for tiny hands and small mouths. They'll help your little one develop good hand eye co-ordination as they play and nibble as well as learning about different shapes, tastes and textures. And, of course, they're delicious too. Key Features Always organic Learning to feed myself Delicious organic ring biscuits made from wheat and banana juice Nothing unnecessary Setting standards No junk promise Suitable for vegetarians Country of Origin - Germany Manufacturers Address - Produced exclusively for: Organix Brands Ltd., Dorset, BH2 5LT. How to Use Storage Store in a cool dry place. Once opened, store in an airtight container. Best Before See Base Lower Age Limit Advisory - Months 7 Hazards and Cautions Safety Advice: Not suitable for children under 7 months. When feeding a child, please ensure they are sitting down and supervised to reduce the risk of choking. While every care has been taken to ensure this information is always as accurate as possible, food products are regularly improved and nutrition content may occasionally change. As a result we recommend that you always read the label carefully before using or consuming any products. Nutritional Reference Value (NRV) information is based on the typical composition of the product. Guideline daily amounts are those for a typical adult (men and women). NRV information for non Boots products is calculated by the manufacturer. Boots has no control over the recipe or nutritional content of such products and information on this site may differ to that given on the product label. We would therefore recommend you do not solely rely on this information and always read the product label. View More In Snack Foods. If you have any questions about this product by Organix, contact us by completing and submitting the form below. If you are looking for a specif part number, please include it with your message.